Visitors to the Grugapark can relax in the green spaces, discover interesting information in the exhibition gardens and glasshouses, and also enjoy an attractive recreational and cultural programme. 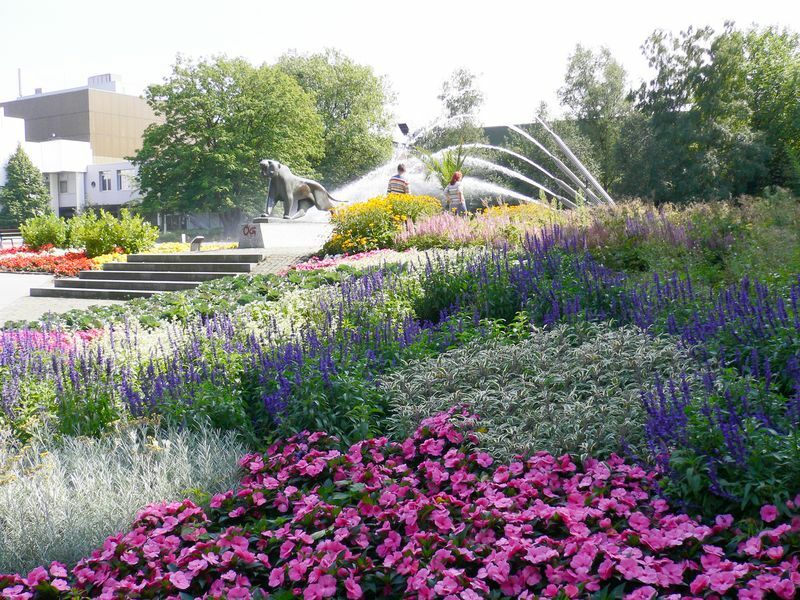 Three generations of Essen’s population have experienced the Grugapark as a place for brilliant displays of flowers, Sunday outings, concerts, play and fun, firework displays and festivals, train rides and many, many unforgettable childhood memories. A walk around the park takes the visitor to the round dahlia garden with its views over the forest valley and to the botanical garden, which not only boasts a collection of Alpine trees and shrubs but also a cascading waterfall and a pond. Furthermore, there is a rose garden, a garden with herbaceous perennials and exotic plants, a water-lily pond, a farm garden, a herb garden, a garden for meditation, a rhododendron dale, and a garden with climbers and creepers. In 1929, the Große Ruhrländische Gartenbau-Ausstellung (Gruga) opened its gates to the public. The aim was to astound visitors with dramatic horticultural art and illuminated waterfalls. After the Second World War, the partly destroyed Gruga was rebuilt with a new concept in mind. In 1952, the park was again the venue for a horticultural exhibition and presented the visitors with a freely created landscape and softly rolling lawns. The former strict geometry was replaced by a natural park form. In 1965, the Gruga hosted the Bundesgartenschau (Federal Garden Show) with new themes which still shape the park today: fun, sport, and active recreation. With its gently rolling hills and old trees, the Grugapark provides a welcome surprise in this industrial part of Germany, the Ruhrgebiet. A walk around the park takes the visitor to the round dahlia garden with its view over the forest valley and to the botanical garden, which not only boasts a collection of Alpine trees and shrubs but also a pond and a waterfall with three cascades. 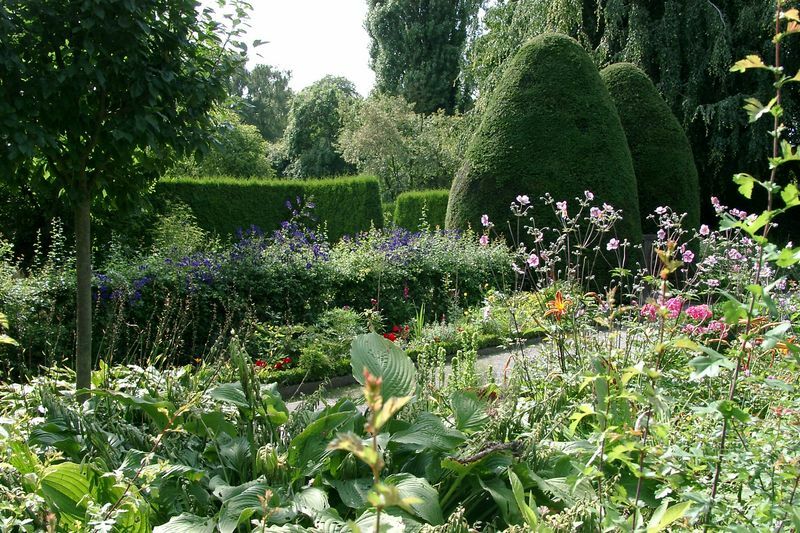 Furthermore there is a rose garden, a garden with herbaceous perennials and exotic plants, a water-lily pond, a farm garden, a herb garden, a garden for the senses, a rhododendron dale and a garden with climbers and creepers. In 1929, the city of Essen hosted the “Große Ruhrländische Gartenbauausstellung”, a horticultural event which was of great importance for the cultural identity of the Ruhr area and has influenced the region up to the present day. It was not just the idea of this horticultural exhibition which alluded to the international art and horticultural exhibitions of the period prior to the First World War (Düsseldorf, Mannheim, Darmstadt) but also the fact that the Ruhrgebiet presented itself a cultural entity at this event for the first time. The Ruhrgebiet conurbation was the area to be most strongly affected by the shifts in economic, social and political relations in the 19th century. Having become a geo-economic entity, the region now endeavoured to develop a cultural identity. The “Große Ruhrländische Gartenbauausstellung“ – Gruga – was an important step in this direction. For many years, the slogan “Sundays to the Gruga” was an expression of how the park compensated the miners and local population for the years of hardship during the last years of the war and throughout the post-war years of reconstruction. The landscape architect Johann Gabriel designed the Gruga, which was built from 1927 – 1929. In 1927, relief workers started working on the development. Today, one finds dahlias, roses and rhododendron bushes on what was a swampy wasteland at the beginning of the 1920s. The next two years saw up to 1,000 unemployed workers transforming this wasteland into a blossoming garden. Every second tree from Essen’s avenues was replanted in the Gruga. Despite numerous difficulties, the building work was completed on time for the opening of the exhibition in June 1929. Individual garden themes were a special feature of the Gruga at that time. Poplar trees, hedges, walls, steps and pergolas separated the various garden areas. Visitors could enjoy sweeping views of the exhibition grounds from the many terraces. Even during that period, the Gruga focused on specific problems of the Ruhrgebiet: plants which tolerated smoke and those which did not were grown in separate gardens. The Gruga also provided information for allotment holders and breeders of small animals. Visitors could stroll to the dahlia arena along terraces planted with summer flowers, listen to music at the radio tower – today’s Grugaturm – and admire the artistic water displays. The Rosencafé and the GrugaTerraces invited visitors to stop for coffee and cake or to go dancing. When dusk fell, the water features and fountains were illuminated. “The industrial area is not at all as dark as its reputation. On the contrary, nature and garden design have managed to form a wonderful synthesis in which the tremendous melody of heavy industrial work harmonises with the human yearning for woods and fields, for flowers, light and joy”. During the Second World War the “flower miracle on the Ruhr” was bombed to rubble. The nearby town hospitals used the grounds to grow vegetables and potatoes for their patients until 1948. In 1951, the city of Essen decided to rebuild the Gruga, and again it was a horticultural exhibition which enabled this goal to be achieved. With little preparation time and little money, a second “GroßeRuhrländische Gartenbau-Ausstellung“ (Gruga) was created in 1952. While the geometrical forms from 1929 and 1938 were replaced by a freely created landscape with softly rolling lawns and open spaces, the design and usage were strongly influenced by the restorative spirit of the post-war years. It was not until the 1960s that the nature of the pluralist leisure society became evident, resulting in the need for a new concept for the park. In addition to the tranquil enjoyment of nature, the park was now to offer recreational activities. The next horticultural exhibition changed the park yet again by including the new themes of sport and recreation and by expanding it to a total area of 70 hectares. A road was re-routed and bridges built to connect the old and the new parts of the park for the 1965 exhibition. Furthermore, a forest dale which had separated different areas took on a connecting role in the form of the Margarethensee lake, and generous sports and playing grounds were also integrated. In 1985, glass pyramids replaced the old glasshouses, thereby allowing the park to present exotic plants from southern countries in a modern setting. But the park also wanted to be a forum for cultural events and in 1987 the new orangery was built. Since then, this has been a venue for regular performances and exhibitions. The 1965 exhibition gave the Gruga its present appearance. The botanical garden and the zoo also focus on ecological relationships and the importance of protecting species and the natural world. Today, the Gruga is a lively modern park with a grand tradition. It provides tranquillity for contemplation and relaxation, places to stroll, and areas for sports and games. A diverse recreational and cultural programme completes the picture. The information centre in the orangery has a wide range of material.